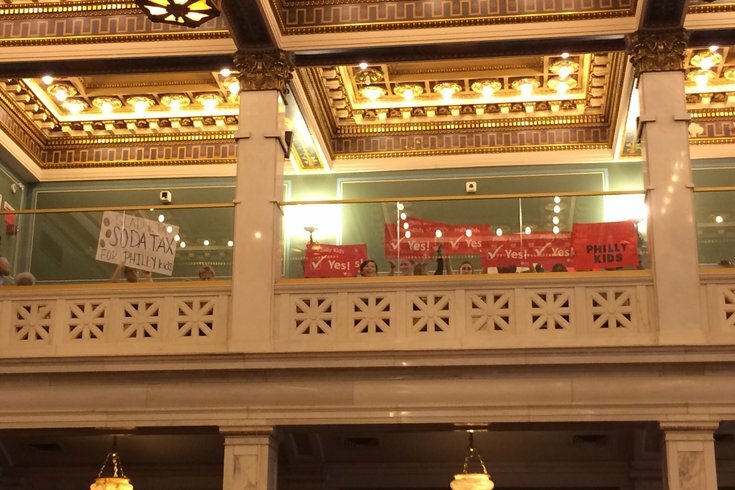 Members of the audience at Wednesday's hearing of City Council's Committee of the Whole, hold signs in the upper deck of council chambers showing support for the proposed sugary drinks tax. If there was any uncertainty over just where City Council president Darrell Clarke (D-5th) stood on Mayor Jim Kenney's proposal to tax drinks with added sugar at a rate of three-cents-an-ounce, he made his position clear Wednesday. And, in talking about the issue, after a hearing held to move the bills for next year's budget forward from Council's Committee of the Whole to being read at the next scheduled meeting of City Council, Clarke said he doesn't think the rest of his fellow council members support the tax either. "I do not believe there is support for three cents an ounce," said Clarke. During the hearing, it seemed as if there might not be councilmanic support for the sugary drinks tax, at the currently proposed rate, as members of council spent much of the day's hearing grilling Rob Dubow, the city's director of finance, on just how much the city could generate if the tax rate were lowered. Dubow said that the lowest the rate could go -- and still afford the community schools, universal pre-K, parks, recreation centers and library improvements and other initiatives in Kenney's budget proposal -- would be a rate of two-and-a-half-cents-per-ounce. Any lower rate than that, he said, and the city wouldn't be able to procure the bonds needed to secure the funding for these programs. Also, throughout the hearing, there was a wealth of discussion on Councilwoman Blondell Reynolds Brown's (D-At Large) proposed container tax. This tax would be assessed on every bottled beverage in the city at a rate of 15-cents per bottle. Unlike the mayor's sugary drinks tax, which would be assessed per-ounce and would be aimed only at beverages with added sugar, Reynolds Brown's bill would hit every bottled beverage - including water. The only exceptions to Reynolds Brown's plan would be milk, fountain drinks and baby formula. Several council members, including Clarke, seemed to support Reynolds Brown's plan as Clarke said it would be "a broad-based, sustainable tax." But, that container tax would only raise $64 million annually, and, it could be even less. When Councilman Curtis Jones Jr. (D-4th) asked Dubow what the container tax might bring in if bottled water were exempted, Dubow replied that by exempting bottled water, it would cut an additional $16.5 million annually from container tax revenues. City Councilman Mark Squilla (D-1st) asked if the container tax could be improved by adding alcohol - which is exempt from the container tax proposal - to the equation. And, while Sozi Pedro Tulane, the city solicitor, said a new tax on alcohol would indeed raise the funds collected through any type of container tax, he didn't believe City Council had the authority to create new taxes on alcohol, because the state's Liquor Control Board is in charge of alcohol regulation in Pennsylvania. But, what if there could be a compromise that could find a way to create both a sugary drinks tax at a lower rate and a container tax, asked Squilla. "I think that would be an administrative nightmare," replied Dubow. During Wednesday's hearing, Clarke spoke openly about the divisiveness of the sugary drinks tax proposal, saying the sugary drinks proposal "has been one of the most divisive proposals since I've been here." Clarke also chided representatives on hand from the mayor's office who were in attendance, saying that there were a number of worthwhile alternative ideas for funding the mayor's initiatives discussed by Council, but these ideas weren't seemingly being taken seriously by the mayor's office. He said it was time to let go of the idea that City Council would ever approve a sugary drinks tax in its currently proposed form. "It troubles me," he said. "There's not going to be a three cent tax.... Unless, there's something going on that I don't know about." Councilwoman Maria Maria D. Quiñones-Sánchez (D-7th) agreed, saying she didn't like either the sugary drinks tax or the container tax. But, what concerned her most, said the councilwoman, was an ongoing discussion that equated not supporting the sugary drinks tax with not supporting Philadelphia's youth. "I am concerned with the rhetoric of using children as shields," she said. Whatever City Council decides to do concerning the sugary drinks tax, they will need to work quickly. Council's last session before the summer break will be on June 16 and City Council needs to approve a budget before then. Until then, Clarke said City Council will continue working, even through the clock is ticking on the need to approve the city's budget. "The clock is ticking ..." he said. "But, we will meet our timeline, whatever we end up doing."